There is a universal question shared by everyone who enters retirement—will I have enough money to support myself (and my spouse) for the rest of our lives? For a lucky few, the answer is an immediate and unqualified yes. For the rest of us, the response varies from cautiously optimistic to inconsolably downbeat. A simple way to clarify your own position is to consult a financial advisor, but most retirees, or those approaching retirement, tend to try to go it alone. And only half of those actually sit down and work the numbers to find out exactly what level of financial cushion they need to live the retirement of their dreams. Their strategy tends to involve treating their savings as either an emergency fund that’s only to be touched in times of crisis or as a piggy bank to fund all their expenses, regardless of the impact on future needs. Neither of these options is particularly appealing. Consider these alternative strategies to help shore up adequate funds for retirement. First things first. Find yourself a financial advisor. Then have him or her put your finances through a probability analysis, which will show how well your savings will handle a crisis situation, such as an unexpected health scare or a sustained downturn in the markets. Always keep a portion of your investments in cash (one to three years’ worth) and bonds (three to five years’ worth). In the event of a catastrophic turn in the market, you’ll have money on hand to carry you through, and you can avoid the need to sell off stock at an artificially low price. Follow the 4 percent rule. A long-popular method of preserving savings is the “4 percent rule,” which suggests drawing down only 4 percent of retirement funds in the first year and then increasing it according to inflation. In recent years, some experts have advised that this number be lower, since investments are more expensive, life expectancies longer, and potential returns lower than in past decades. Wait to claim Social Security. The average retiree’s main income source, other than savings, is often Social Security. It can be a foundation on which to build your investments. It doesn’t change with the markets, increases with inflation, and stays with you as long as you live. 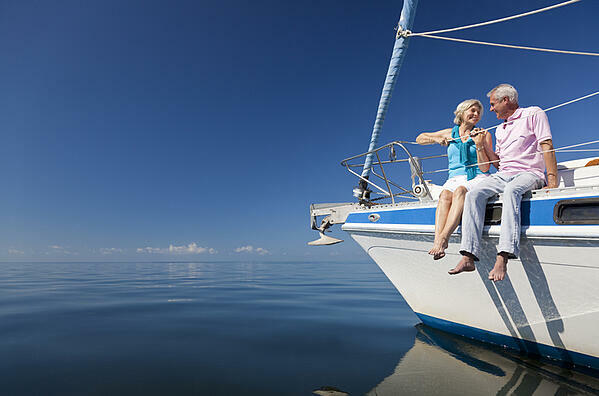 For most retirees, Social Security represents 75 percent or more of their total income, which leaves savings free to be invested in stocks and attain the highest possible growth. Though it can be tempting to start claiming at the earliest possible age (62), those who wait until age 70 will get a much higher amount. If you’re married, the partner who earns more delays until 70, but your working spouse need not wait that long; they can claim once they hit age 65. As mentioned above, one of the reasons people empty their accounts prematurely is a health-related crisis, which can include a heart attack, cancer, or in-home/nursing home care. It may provide valuable peace of mind to purchase long-term-care insurance, which ensures these scenarios will be covered, at least in part. The policy need not be overly expensive or comprehensive—just enough to take the edge off unforeseen medical needs. In addition to Social Security and other investments, it may also be worth adding your home as a potential retirement income source. But moving from that four-bedroom colonial to a quaint ranch or condo can throw off money in the six figures to be put toward other expenses. If selling your home is out of the question, then it might be the perfect time to refinance. Another revenue stream to consider is an annuity, which provides guaranteed lifetime income untouched by market volatility. This lessens the chances that you’ll burn through your savings and puts some of your longevity risk in the hands of an insurance company. Annuities can also help you budget your savings more effectively and avoid “lifestyle creep,” where monthly expenses over time take up a larger and larger portion of savings. No matter which of these tools you use, a financial advisor is essential to a smart retirement strategy. Start today with our retirement calculators, which can begin to answer questions about savings, 401(k) plans, inflation, and much more. Don't miss out. Subscribe to the Advice Center today!